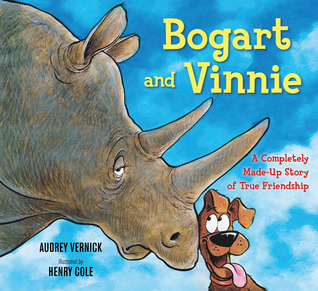 When Vinnie, a hyperactive, overly-enthusiastic dog finds himself lost one day, he stumbles into a wild animal preserve and befriends a curmudgeonly rhino named Bogart. Well, at least Vinnie thinks they're friends. To say Bogart is dubious (and maybe a tad bit bored) of Vinnie might be an understatement. But soon the media gets wind of this interspecies friendship and reporters flock to the animal preserve, making Bogart and Vinnie famous. Will their friendship last the test of fame? And what about Vinnie's home? Will his family find him and take Vinnie away from Bogart? In my eyes Audrey Vernick can do no wrong. I continue to marvel at the smart, sassy humor in her fictional picture books and the sincerity and heart in her nonfiction picture books. Everything she writes has such a cleverness about it, right down to the zebras in this book whose names are Polka and Dot. I wish I were that clever. Vinnie's enthusiasm comes off as both annoying and endearing at the same time, a trait I know many a dog owner can relate to, and Henry Cole's illustrations are the perfect accompaniment to showing the reader the striking variance of personalities between Bogart the curmudgeon and Vinnie eager optimist. Audrey was gracious enough to read my class and their third grade buddies Bogart and Vinnie via Skype on World Read Aloud Day in March so I already knew I loved the story, but being able to see the words and illustrations up close made it even better. If you are an animal lover, or just plain like funny stories, then pick yourself up a copy of Bogart and Vinnie today! Agreed! Audrey Vernick is one of the best PB authors around. Also loved Water Balloon, her MG. I can see Bogart and Vinnie's personalities already, just from the cover. Looks great.